1 year standard warranty on all products. 7 people have bought this item! The unique upright storage system for securing your strimmers. Strimmers are among the most commonly stolen power tools. The StrimmerSafe Rack™ keeps your strimmers secure and organised while maximising storage space. This unique multi-purpose storage system can be used to secure up to five strimmers, or similar machines such as hedge cutters and chainsaws. Robustly constructed, with twin 5-lever deadlocks and a hinged heavy-duty welded lid, the unit can also be bolted to a wall for added security. The base is fitted with a bunded drip tray to contain accidental spills of oil or fuel. Keeps strimmers organised while maximising storage space. Highly secure unit to protect your valuable equipment from theft and damage. Ideal for landscapers and green keepers. Storage of up to 5 strimmers. Multi-purpose – can also be used for storing hedge cutters, leaf blowers, chainsaws, etc. High security – 5-lever deadlocks, serial numbered for easy key replacement. Lid is fitted with 2 hydraulic gas arms for easy lifting. Liquid-tight base contains any accidental spills of oil or fuel. Facility for bolting to a wall. Sorry! There are currently no reviews for this product. 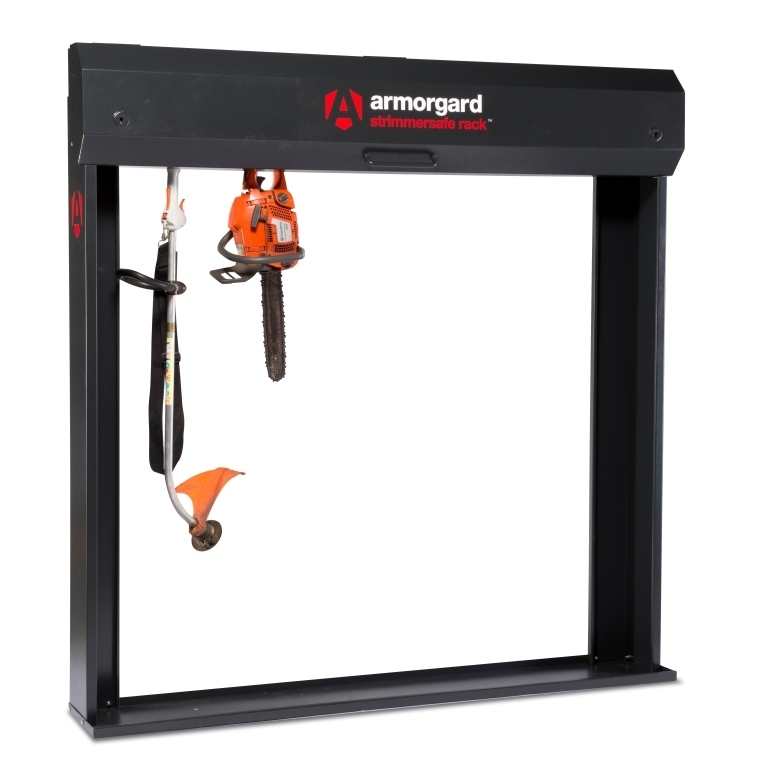 Armorgard StrimmerSafe Vault 1800x555x445 - Code S . . .
Armorgard StrimmerSafe Vault 1970x675x665 - Code S . . .
Armorgard StrimmerSafe Vault 1275x515x450 - Code S . . .
See all 3 related products . . .
Clarke CS4600BO Heavy Duty Boltless Shelving 600kg . . .
Clarke CS4700OBO Industrial Racking With Laminate . . .
Clarke CS41000BO Heavy Duty Boltless Shelving 1000 . . .
Clarke CSR4550/50BO Heavy Duty Boltless Shelving 5 . . .